If you listen to many stories, watch many films, or read many narratives, you are bound to begin recognizing patterns. No matter what culture produced the story, we can find elements that are familiar. The name for these patterns or elements are called archetypes. 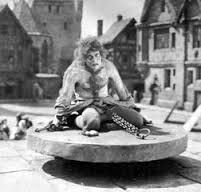 Quasimodo from "The Hunchback of Notre Dame"
The character archetype we’re looking at today is The Outcast. Many have been the victims of bullying or feeling outside a popular social clique, so it’s easy to feel a connection with outcast figures. They touch something deep within us, a kind of empathetic understanding, yet they can also repulse us pushing us more towards the community shunning them. You know this archetype. It’s people like Boo Radley (To Kill a Mockingbird), Huckleberry Finn, Hester Prynne (The Scarlet Letter), and pretty much the entire cast of Freaks. This archetype goes all the way back to the Anglo-Saxon epic poem Beowulf. And stop rolling your eyes! It’s an awesome story! 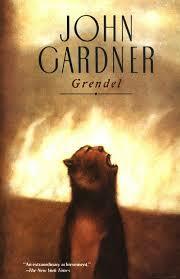 Grendel is the ultimate outcast, shunned by Hrothgar’s community. It’s this lack of communal inclusion that causes his rampages in the first place. Sunning someone most definitely reeks consequences on the group. Just remember what happens once that pig blood gets dumped on Carrie. 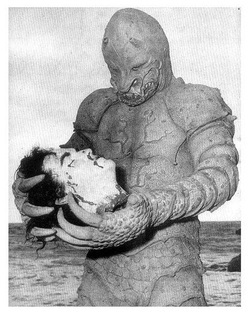 In The Monster of Piedras Blancas, we find a good example of the archetype of The Outcast. 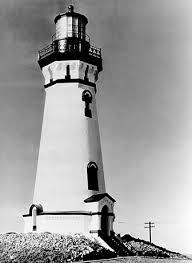 Sturges is the lighthouse keeper in the coastal town of Piedras Blancas. He’s pretty much an ornery cuss whose job appears to be yelling at anybody who comes near the lighthouse. It’s obvious he’s got a secret. His daughter is much beloved by the townsfolk. When people start mysteriously dying without their heads (don’t you just hate when that happens? ), the quick-witted authorities snap into action and decide it’s not a monster…and do nothing. Classic. In literature, the Outcast, is usually someone who is shunned for some reason. In this film at first it seems to be a self-imposed isolation that Sturges has grown to like since the death of his wife. He sends his daughter away to boarding school when she is only nine. As the plot unfolds, we come to find out that it’s Sturges who has been feeding and nurturing the reptilian-like monster whose appetite has grown beyond the meat scraps he’s been fed all these years. It’s easy to see both Sturges and the monster as outcasts. They are two sides of the same mirror. The monster is a symbol for Sturges’ isolation and loneliness. Rather than seeking out the comfort of community, he feds his loneliness through the years until it literally destroys him in the end. The symbolic link is complete by both Sturges and the monster dying in the exact same fashion. The wonderful irony in the film is that though Sturges is an outcast, his role of lighthouse keeper, which he takes almost obsessively seriously, is one of protector. Indeed, the fact that he takes care of the creature shows he is nurturing and caring. We come to understand the act of sending his daughter away was for her own protection, being so unpleasant to everyone who comes near the lighthouse is actually an act of community protection. Sturges’ sacrifice of self-ostracism brings him dangerously close to becoming the scapegoat (another archetype). But the Piedras Blancas citizens never come to blame Sturges. It’s easier to ignore him and joke about him than to try an understand him. While he rails at his daughter’s disobediences, she placates him every time with kindness and sympathetic understanding. It begs the question how this story would have gone had the community taken the same approach as the daughter. For a schlocky creature feature that was graphic for its day (it was the first movie ever to show a severed head in the hands of someone! ), it actually has a complexity of ideas. The science teacher charged with figuring out what this creature is ruminates, “Does he have a brain that’s capable of rational thought, or is he just a beast? If he can think, we’re in real trouble.” The same could be said about the outcast archetype with a slight change – does he have a heart capable of feeling? If so, like we find out about Sturges, then it’s the community that is the actual monster. There’s also some fun to be had by watching this film. You will laugh out loud at the ending when Sturges is at the top of the lighthouse and he has trapped the monster and he shouts down to the mob of citizens outside some famous last words… “He’ll never get through the steel door!” At that point, you kind of want to cheer for the monster to throw him off the lighthouse. The film lifts some iconic scenes from other…inspirations…shall we say? Hehehe The monster looks like the Creature from the Black Lagoon as he carries the damsel away, and he climbs the lighthouse at the end like King Kong. I can honestly say though, after Virginia Wolf’s To the Lighthouse almost boring me to death, this is the second lighthouse related narrative that has threatened me! But I enjoyed them both, actually. An essential part of many narratives.